The Republican debate in South Carolina last night (Monday, 16 January) was one of the better ones of the far-too-myriad number of debates for this season. There were several answers and exchanges that were instructive and entertaining, not the least of which was the reply of Newt Gingrich to Juan Williams on the subject of food stamps. WILLIAMS: Speaker Gingrich, you recently said black Americans should demand jobs, not food stamps. You also said poor kids lack a strong work ethic and proposed having them work as janitors in their schools. Can't you see that this is viewed, at a minimum, as insulting to all Americans, but particularly to black Americans? In terms of sheer energy, it was clearly the high point of the evening. For that matter, it was the first time in my recollection (or that of Frank Luntz, who has followed these debates far more closely than I) that a standing ovation has occurred at a presidential debate. 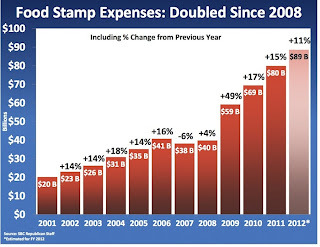 The federal budget for food stamps under Obama has doubled since George W Bush left office, despite a negligible increase in population. The number of people on food stamps has risen from 32 million to 46 million. One can argue the claim that the poor and stagnant economy (it is technically improving, but at a glacial pace) is largely responsible, but a large part of it is the massive increase in fraud, left unaddressed by the administration. Update: Let me add a note about Juan Williams here. (I am rarely able these days to post a complete article as timely as I would like.) I like Juan Williams and I value his left-of-center perspective on the issues, even though I frequently disagree. His points are thought out and he is clearly motivated by sincerity. I look forward to his frequent appearance on the panel of Fox News Special Report because I know that his sparring with the likes of the estimable Dr Charles Krauthammer will be perhaps the most entertaining moments of the show. But his questioning here shows the bias of the Sophisticati that drives the animus of those of us outside the urban centers of the elite. Williams manages to define blue-collar work, particularly that of a janitor, as insulting, “particularly to black Americans”. It is no wonder that the clueless Williams sets himself up for being booed when he takes Gingrich to task for pointing out the explosion of food stamps by an administration that has done so little to alleviate the condition. Such members of the patronising elite would do well to meet such people as the fellow who lives down the road from me, a former Director of the Office of Maintenance and Operations at a major university, who is now happily a semi-retired janitor at an elementary school, or to read the life of John Newton, former English slave ship captain and later famous minister and preacher, author of “Amazing Grace”, mentor of Wilbur Wilberforce who was responsible more than any other for the ending of the slave trade, the same Newton who spent hours each day scrubbing the stone floors of his expanding church in Olney (captured so well in the movie Amazing Grace). I have known many such people, formerly high-placed but then brought low for a variety of reasons, not infrequently voluntary, or those of high station and privilege, particularly and ironically in academia (‘highly educated’, as it were) who tightly embrace a sense of willful ignorance, who decry the class structure but fail to realize that their efforts only exacerbate it (or more likely they fully realize it, yet continue with an eye toward maintaining their place in the pecking order). We are all equal in the eyes of God. Perhaps that is why so many of the present-day elite are so disdainful of religion. For the most recent month with available data, October 2011, 46.2 million people were enrolled in the food stamp program, which is formally known the Supplemental Nutrition Assistance Program (SNAP). Since Mr. Obama took office, the percent increase in enrollment has been 44.5 percent. However, that percentage increase hardly makes Obama the "best food stamp president in American history," at least when you look at the question proportionally. The percent increase in beneficiaries during Mr. Bush's presidency was higher than it has been under Mr. Obama: The number of beneficiaries went from 17.3 million in 2001 to 28.2 million in 2008 -- an increase of 63 percent in years that are mostly considered non-recessionary. Although that 63% increase is nothing for Bush to be proud of, CBS presents these statistics misleadingly to make Obama look better. First, given CBS's numbers, the rate of increase in food-stamp enrollment has been almost twice as great under Obama than Bush. A 63% increase over seven years works out to 7% annual growth. A 44.5% increase over three years is an annual rise of 13.1%. Second, this is arguably a case in which the increase in numbers means more than the increase in percentages. 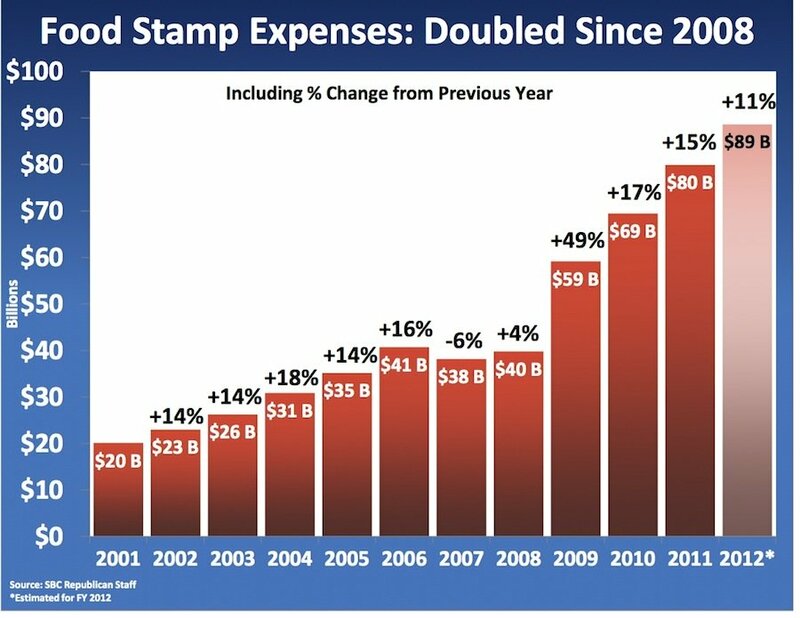 In the three-year period CBS ascribes to Obama, the food-stamp rolls have increased by 18 million people, or 6 million a year. In the seven years attributed to Bush, the increase was 10.9 million, or 1.6 million a year. Almost four times as many Americans have gone on food stamps every year during the Obama years than during the Bush years, and the percentages are not increasing as quickly precisely because the numbers are.